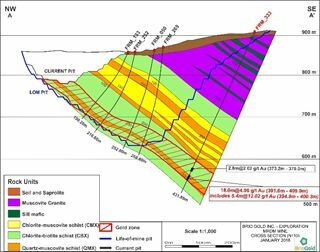 TORONTO, ON--(Marketwired - January 10, 2018) - BRIO GOLD INC. (TSX: BRIO) ("BRIO GOLD" or the "Company") is pleased to announce positive results from its recently completed drill program at its Riacho dos Machados ("RDM") mine, which includes 9.4 metres of 12.04 grams per tonne (g/t) gold and 5.2 metres of 12.02 g/t gold (true thickness), both within wider high-grade zones of 24.0 metres of 5.41 g/t and 18.0 metres of 4.96 g/t, respectively. The program also extended the open pit resource down dip, with higher than average mine grade intercepts that verify the geologic model of resource continuity consistent with greenstone belt deposits typical in Brazil. The drilling program achieved four resource objectives: 1) To expand the Mineral Reserves of the existing planned life-of-mine (LOM) pit. 2) To demonstrate the continuity of mineralization down-dip from the current LOM pit into areas that were previously underexplored. 3) To develop a high-grade Mineral Resource near the pit bottom that extends to depth. 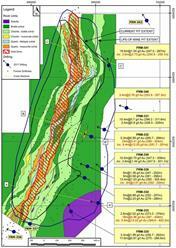 4) To test these wide high-grade zones for underground mining potential. This potential may allow for supplemental gold production within the capacity of the existing plant, by supplanting some lower grade open pit tons with high grade underground production in the LOM plan. All drilling data will be incorporated into an updated Mineral Reserve and Mineral Resource estimate. The updated Mineral Reserve and Mineral Resource estimate is expected to be completed in the first quarter of 2018. The exploration program completed in 2017 at the RDM mine consisted of a total of 3,365 meters of core drilling contained within 11 resource holes intended to extend the mineralization down-dip (see Appendix A for a drill hole location map). The new resource holes were generally 100-meter step outs to the previous drill locations. All intercepts are consistent with the down-dip projection of the mineralized zones encountered in the current open-pit mining operation. 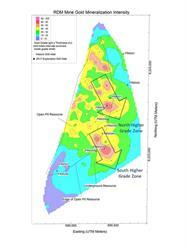 Higher-grade mineralization is focused along southeast plunging mineralized zones or "shoots", within the plane of the tabular mineralized zone. See Appendix B for representative cross sections. See Appendix C for a grade thickness map and an interpretation of the higher-grade zones, which demonstrates higher intensity at depth. A summary of significant intercepts is provided below. Note: intercepts lengths are approximately true thickness. The Company is planning additional drilling with the objective of continuing to expand the high-grade horizons down plunge and along strike. 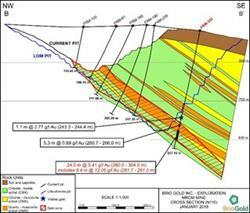 In addition, Brio Gold intends to further advance RDM by completing a Preliminary Economic Assessment (PEA) on the viability of an underground operation supplementing the existing open pit mine production. The objective of the PEA will be to determine if the RDM Underground Measured, Indicated, and Inferred Mineral Resources have the potential for economic extraction, and warrant more detailed and specific analysis. This study would also evaluate the most optimum LOM open pit if the operation was to include an underground contribution. The water storage facility at the RDM mine was completed on time and on budget in early 2017. With the start of the rainy season in November 2017, the reservoir is now building large water reserve volumes. Given the current stored volume and the rain forecast over the remainder of the rainy season, the Company expects storage of more than enough water for a full production year in 2018 and beyond. The installation of the main powerline and substations, which will connect RDM to the power grid and replace the diesel power generators, remains on track for commissioning in the second quarter of 2018. Following the completion of the power line and additional minor modifications to the crushing circuit, the plant throughput is expected to increase from its current run rate of 7,000 tonnes per day to 9,000 tonnes per day. Cash costs are expected to substantially decrease as a result of significantly lower energy cost and economies of scale. Brio conducted its drill hole sampling and analysis in accordance with best practice protocols using industry-standard methods. All analytical work is conducted using a Quality Assurance and Quality Control (QA/QC) program. Samples were picked up from the mine site and transported to an independent, certified commercial laboratory, ALS Brasil Ltda., a division of ALS Global, with sample preparation in Belo Horizonte, Brazil, and fire assays at their Lima, Peru facility. Sample preparation and fire assays were conducted with laboratory standard protocols. Brio's complete analytical QAQC program, included the routine use of standards, blanks, and duplicates, applied to all samples analyzed by ALS Laboratories. Duplicate checks were conducted on a regular basis by a second independent commercial laboratory located in Belo Horizonte, Brazil. Mr. Mark G. Stevens, Registered Geologist and C.P.G, is Vice-President, Exploration for Brio Gold and provided executive assistance during the drilling campaign and subsequently reviewed and confirmed the technical information contained in this press release. Mr. Stevens is a Qualified Person as defined in Canadian National Instrument 43-101 and confirms that to his knowledge all information contained in the press release is accurate and reliable. Brio Gold is a new Canadian mining company with significant gold producing, development and exploration stage properties in Brazil. 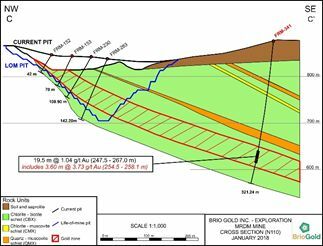 Brio Gold's portfolio includes three operating gold mines and a fully-permitted, fully-constructed mine that was on care and maintenance and currently is in development to be re-started at the end of 2018. Brio Gold produced approximately 190,000 ounces of gold in 2016 and at full run-rate expects annual production to be approximately 400,000 ounces of gold. CAUTIONARY NOTE REGARDING FORWARD-LOOKING STATEMENTS: This news release contains or incorporates by reference "forward-looking statements" and "forward-looking information" under applicable Canadian securities legislation. Forward-looking information includes, but is not limited to information with respect to the Company's strategy, plans or future financial or operating performance, the outcome of the legal matters involving the damages assessments and any related enforcement proceedings. Forward-looking statements are characterized by words such as "plan," "expect", "budget", "target", "project", "intend", "believe", "anticipate", "estimate" and other similar words, or statements that certain events or conditions "may" or "will" occur. Forward-looking statements are based on the opinions, assumptions and estimates of management considered reasonable at the date the statements are made, and are inherently subject to a variety of risks and uncertainties and other known and unknown factors that could cause actual events or results to differ materially from those projected in the forward-looking statements. These factors include the Company's expectations in connection with the production and exploration, development and expansion plans at the Company's projects discussed herein being met, the impact of proposed optimizations at the Company's projects, the impact of the proposed new mining law in Brazil, and the impact of general business and economic conditions, global liquidity and credit availability on the timing of cash flows and the values of assets and liabilities based on projected future conditions, fluctuating metal prices (such as gold and silver), currency exchange rates (such as the Brazilian real versus the United States dollar), the impact of inflation, possible variations in ore grade or recovery rates, changes in the Company's hedging program, changes in accounting policies, changes in mineral resources and mineral reserves, risks related to asset disposition, risks related to metal purchase agreements, risks related to acquisitions, changes in project parameters as plans continue to be refined, changes in project development, construction, production and commissioning time frames, unanticipated costs and expenses, higher prices for fuel, steel, power, labour and other consumables contributing to higher costs and general risks of the mining industry, failure of plant, equipment or processes to operate as anticipated, unexpected changes in mine life, final pricing for concentrate sales, unanticipated results of future studies, seasonality and unanticipated weather changes, costs and timing of the development of new deposits, success of exploration activities, permitting timelines, government regulation and the risk of government expropriation or nationalization of mining operations, risks related to relying on local advisors and consultants in foreign jurisdictions, environmental risks, unanticipated reclamation expenses, risks relating to joint venture operations, title disputes or claims, limitations on insurance coverage and timing and possible outcome of pending and outstanding litigation and labour disputes, risks related to enforcing legal rights in foreign jurisdictions, as well as those risk factors discussed or referred to herein. Although the Company has attempted to identify important factors that could cause actual actions, events or results to differ materially from those described in forward-looking statements, there may be other factors that cause actions, events or results not to be anticipated, estimated or intended. There can be no assurance that forward-looking statements will prove to be accurate, as actual results and future events could differ materially from those anticipated in such statements. The Company undertakes no obligation to update forward-looking statements if circumstances or management's estimates, assumptions or opinions should change, except as required by applicable law. The reader is cautioned not to place undue reliance on forward-looking statements. The forward-looking information contained herein is presented for the purpose of assisting investors in understanding the Company's expected financial and operational performance and results as at and for the periods ended on the dates presented in the Company's plans and objectives and may not be appropriate for other purposes.